Global microwave equipment market expected to reach around USD 6.95 billion by 2024, at a CAGR of approximately 3.56% for the forecast period from 2018 to 2024. The microwave equipment market is gaining attention due to rising demand for the microwave transmission technology across the globe. The report analyzes and forecasts the microwave equipment market on the basis of technology, vertical, and regions. The study shows past data from 2015 to 2017 along with forecast from 2018 to 2024 based on revenue (USD Billion). Assessment of market dynamics gives a brief thought about the drivers and restraints for the microwave equipment market along with the impact they have on the demand over the forecast period. Furthermore, the report includes the study of opportunities available in the microwave equipment market on a regional level. The report gives a transparent view of the microwave equipment market. We have included a detailed competitive scenario and portfolio of prominent vendor’s operative in the microwave equipment market. To understand the competitive landscape of the microwave equipment market, an analysis of Porter’s Five Forces model for the market has also been included. The report offers a market attractiveness analysis, wherein technology, vertical, and regional segments are benchmarked based on their general attractiveness, market size, and growth rate. The study provides a crucial view of the microwave equipment market by segmenting the market based on technology, vertical, and regional segments. All the segments of the microwave equipment market have been analyzed based on present and future trends and the market is estimated from 2018 to 2024. In terms of technology, the market is divided into LTE, HSPA/HSPA+, WiMAX, satellite, wireless broadband. Further, on the basis of vertical, the microwave equipment market is segmented into banking, financial services, and insurance (BFSI), IT and telecom, media and entertainment, public sector, retail, manufacturing, healthcare, and other verticals. The market is analyzed based on five regions namely North America, Europe, Asia Pacific, Latin America, and the Middle East and Africa. The regions are also fragmented into major countries such as the U.S., the UK, France, Germany, India, China, Japan, and Brazil. 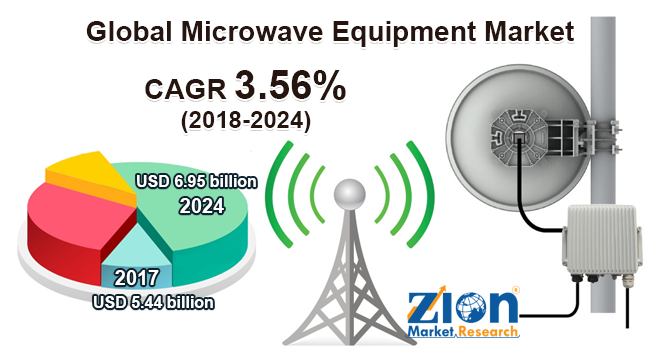 The major participants for the microwave equipment market include ZTE Corporation, Ericsson, Huawei, Nokia Networks, Bridgewave Communications, Alcatel-Lucent, Dragonwave, NEC, and Proxim Wireless. Other industry participants include Ceragon Network Ltd., Aviat Networks, Exalt Communication, E-band, Adtran, Intracom Telecom, SIAE Microelettronica S.p.A, Cambridge Broadband, Trango System, and Siklu, among others.